The strange, sad tale of South African 800-meter champion Caster Semenya is starting to wind down. After rigorous gender testing by the International Association of Athletics Federations (IAAF), it has been determined that Caster Semenya is not really a woman. Nor is she really a man. Caster has internal testes and no ovaries or womb, which classifies her as intersexed. She has been asked to get surgery to remove her internal testes as soon as possible, because apparently they tend to become cancerous. However, she might not have to end her career as a sprinter, and she may get to keep her gold medals. 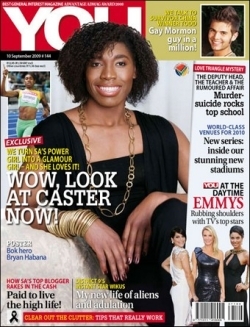 Caster’s future is still up in the air. Unfortunately for her, she was born with a unique medical condition that has thrown her into the center of a war of words between the IAAF, the African National Congress, and Athletics South Africa (ASA). The ASA is crying racism, despite the IAAF having advised other intersexed athletes to retire in years previous. She’s a pawn now, being moved around the chess board by forces no 18-year-old could possibly understand. She’s the center of a gender/race/nationalism/colonialism war that started years before she was born and will continue for years to come. All the while, both sides continue to expose information about her medical records that probably shouldn’t be publicly discussed. There’s not an 18-year-old girl (and she does identify herself as a girl) who wouldn’t be hurt and upset by this treatment. I know I’ve made jokes about it already, but now I just feel bad for her. I know international athletes are routinely tested, screened, poked, and prodded in any number of embarrassing ways, but this is unusual (and unusually public). Instead of waiting until their next meeting in November, the IAAF should do this girl a solid and hand down their decision ASAP.